Hanuman Tibba is a stunning pyramid peak rising at an elevation of 5860 meters. 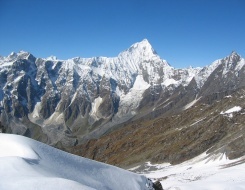 This imposing peak is perched on the Pir Panjal Range above the Solang Valley in the North of Manali. The trek is highly popular among the hikers. The importance and popularity of this trek can be understood from the fact that Western Himalayan Mountaineering Institute of Manali takes the students of advance course to this trek. The trek offers surreal views of majestic mountains and other examples of nature's opulence. This 18 nights and 19 days itinerary offers the tourists to explore the splendiferous Hanuman Tibba in a gratifying manner. The travellers have to reach Manali through Volvo AC bus. The trek incorporates visiting several intriguing places highlighting nature's exquisiteness such as Solang Valley, Dhundi, Beas Kund, and many more. Expedition to the summit undoubtedly leaves the trekkers amazed and contended. On arrival at the New Delhi airport, meet our representative who will then transport you to your already booked hotel in Delhi for an overnight stay. In the morning after breakfast, we will take a Delhi sightseeing tour. Later in the evening, we will drive to Manali by an AC Volvo bus coach around 6.30pm and have an overnight journey in AC Volvo bus. We will reach Manali in the morning where our executive will meet you at the Volvo parking and transfer to hotel & check in. Later explore the nearby area by own. We’ll meet after lunch to familiarize you with the expedition team. Enjoy an overnight stay at the hotel in Manali. The day is free to relax since something challenging is waiting for you in coming days. You can sit in your hotel or walk around to feel the beauty of Solang Valley. Today, we will visit the last village in Solang Valley, a place where Beas river meets its first tributary coming from Beas Kund and Rohtang Pass. The last place to stock up with a few essentials before heading to the mountains. An overnight stay in the hotel. After breakfast in the morning, we will trek to Beas Kund, a serene lake from which River Beas originates. On the way, you will see the glacier and snow capped peak all around you here. Feel the white beauty here. Later return back to the hotel for a night stay. The day is again free for leisure to relax and explore the nearby area. Today, we will enjoy a ferry to Tentu Pass, which is most important part of Hanuman Tibba expedition. On the way, we need to cross this pass with help of technical climbing. (Through Gully or Left side wall). Today, we will occupy Camp 1 and enjoy an overnight stay at the camp 1. The next two days are reserved for the opening up for Camp 2. Overnight stay at the Camp 1. Today, we will occupy the Camp 2 and take pleasure of an overnight stay in the same. Today, we will fit our Summit camp and enjoy an overnight stay in it. On day 14 and 15 we will attempt for Summit. After Summit of Hanuman Tibba, we will come back to Beas Kund camp today and enjoy a night stay in it. We will reach the Solang Valley till afternoon in Manali. Later in the evening, we will roam around Manali and do shopping. Later return back to the hotel for an overnight stay. Today we will wake up a bit late in the morning and after freshen up leave to explore the surroundings of Manali. Later, we will drive to New Delhi in the evening by AC Volvo bus which is a journey overnight. On arrival in New Delhi in the morning, our representative will transfer you to the international airport to catch the flight for onward destination. End of tour and services.